SCMP Group Ltd (SEHK: 583), Asia’s leading media holding company, today announced the revamp of Destination Macau and its sister publication DM Exclusive, two luxury Macau-focused lifestyle magazine titles acquired by the Group recently. Published in English and Simplified Chinese, the two titles will refocus content to bring editorial flair and advertising opportunities in Macau to a new level, in step with the city’s growing tourism- and retail-led economy. The first revamped Destination Macau will meet readers today while DM Exclusive will be published later this month. Under the aegis of the SCMP Specialist Publications division, Destination Macau and DM Exclusive are independent from the hospitality / gaming brands in Macau, and hence are uniquely positioned to connect readers with all of Macau’s best in life. A team of SCMP specialist journalists is dedicated to curate the content and identify the latest international trends in all aspects of luxury lifestyle. Target readers include affluent, modern and discerning luxurists who actively seek leisure, gourmet cuisines, world-class entertainments and ritzy lifestyle in Macau. Editorially, the content of both magazines has undergone an overhaul. Destination Macau informs and inspires with striking photographs, interviews with local and international tastemakers; and offers a fresh and insightful look at trends, people and places defining the worlds of culture, entertainment, fashion and food. 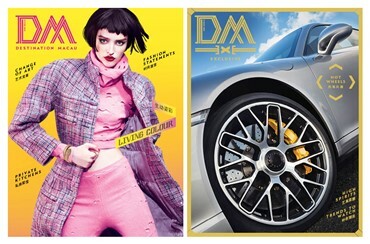 DM Exclusive, distributed exclusively in VIP-only premises in Macau, is the only magazine that caters for the city’s ultra-high net-worth individuals looking for unique items and one-of-a-kind experiences. In the Sep/Oct issue, Destination Macau’s unique content includes exclusive interviews with Lisboa Hotel and Grand Lisboa’s French chef Joel Robuchon, who has bagged more Michelin stars than anyone else on earth and revolutionized dining in Macau; and world-renowned Zou Shiming, China’s most accomplished boxer of all time and the current WBO International Flyweight champion who will share his thoughts on his favourite things to see and do in Macau. The issue will also put the limelight on five of the hottest private kitchens in Macau that are cooking up a storm with Macanese and European cuisines. First published in 1903, the newspaper has developed an enviable reputation for authoritative, influential and independent reporting on Hong Kong, China and the rest of Asia. Available in print, mobile, tablets and online through scmp.com and e-reader editions, South China Morning Post reaches a global audience with daily breaking news, analysis and opinion, multimedia articles and interactive forums. The South China Morning Post received over 160 awards in 2013-14 for excellence in editorial, marketing and technical capability. Other titles in the Group include the Sunday Morning Post, Nanzao.com (南早.com), Nanzaozhinan.com (南早香港指南.com), STYLE, Destination Macau, The PEAK, HK Magazine, The List, Where Hong Kong, and Where Chinese玩儿. Through the joint venture partnership with Hearst, SCMP Hearst publishes the Chinese editions of Cosmopolitan, CosmoBride, Harper’s BAZAAR, Harper’s BAZAAR Art, Harper’s BAZAAR Bride, Esquire, ELLE, ELLE Men, ELLE Wedding, ELLE Décoration, and ELLE Accessories; and operates ELLE.com.hk, Cosmopolitan.com.hk, Harpersbazaar.com.hk, Cosmogirl.com.hk and EsquireHK.com in Hong Kong.